THE 145th Bushy Park Show will be held this Saturday, February 16, at the showgrounds on Gordon River Rd at Bushy Park. Show secretary Alison Hennessy said the traditional country show events would be well-represented with cattle and sheep judging and junior handling, while the equestrian competition will also include mini horses. "The ever-popular woodchopping and chainsaw racing will be happening as usual. Animal displays include snakes, poultry, goats (dairy and mini), with an animal nursery for adults and children to see animals at close hand," Ms Hennessy said. In recent years the Bushy Park Show has provided a varied program in the demonstration shed and one of the highlights this year will be Gretna girl Freya Downie, 14, who will show how to make caramel cheesecake and a quick-to-prepare salad. Other demonstrations will include the latest art craze - acrylic pours - while there will also be interactive sessions including Jeanne Able showing beeswax wraps as an alternative to clingfilm for children’s lunches. Public participation will also be encouraged when the Angel Gowns organisation demonstrates the making of fabric hearts for mums of premature babies. "We also have origami and other craft activities especially for children but also acrylic pours where adults are welcome to try their hand. This will be demonstrated by 10-year-old Saphfire Simpson," Ms Hennesy said. Ponies and miniature horses were popular at last year's show. Around the ground, other demonstrators will include a blacksmith Phil Green and a Free Lee with old woodworking, automotive and metalwork tools, which will be set up for people to experience. A pet parade competition is also scheduled. "For the first time at an agricultural show, the Epona’s Horse Archers promise to provide a lot of interest and excitement, as they show their skills. These riders will do regular demonstrations of horseback archery throughout the day, with a separate area set up for children who can pay to have a go using blunt tip arrows, with members leading the horses," Ms Hennessy said. Sands Family Circus will once again entertain with an afternoon performance, followed by a chance for showgoers to try their crazy fun bikes for free. Throughout the day, Pandara Kelpies will demonstrate the rounding-up of sheep and ducks. 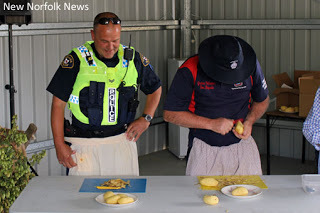 Constable Paul Britten won the first two Pollie Peel-Offs. The Pollie Peel-off will be back for 2019, as local councillors and state and federal politicians compete in a potato peeling competition. Live music, trade sites, a variety of food and drinks will all be on offer, and a 10-prize raffle will be drawn on the day. There is a good homecraft competition program that has been revised for this year with a separate section for children aged from 5-16. "With Hamilton Show no longer holding a homecraft, jams and preserves competition, Central Highlands residents should definitely consider entering our competition this year," Ms Hennessy said. Home brewers and amateur honey producers also have their own sections with sponsorship prizes on offer. 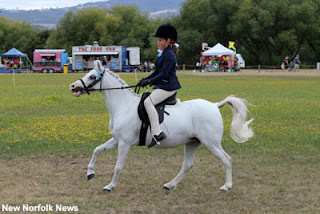 For competition schedules and entry forms visit the website at www.bushyparkshow.com.au or email bushyparkshow@hotmail.com. Inquiries can also be made by phone on 6286 5156 and via Facebook. Entry to this year's show will cost $18 for a family of two adults and 3 children (5-16 years). Individual prices are $7 for adults, $3 for children, and infants under five are admitted free. Disability parking will be available and anyone holding a companion card will have free admission.